It is no secret that one of the most innovative products, if not the most innovative product, was the release of the smartphone by Apple back in 2007. Since then, mobile communication has taken off. Texting, email, you name it – people are typing away. However and oddly enough, one problem was prevalent for several years: the auto correct feature. In fact, most devices today still have terrible auto correct technology on their mobile devices. There is an entire website dedicated to hilarious (but NSFW) auto correct fails. 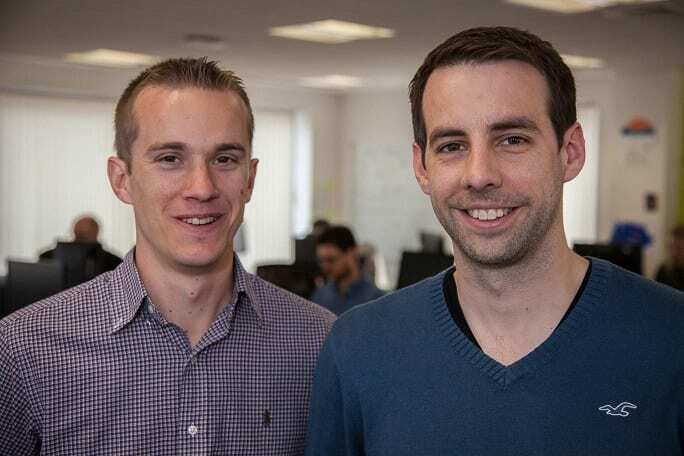 But before we go any further, allow us to introduce this week’s Geek of the Week: Jon Reynolds and Ben Medlock, Co-founders of Swiftkey. For those of you who weren’t paying attention to cloud news this week, Swiftkey was purchased by Microsoft for a whopping $250 million. Swiftkey is one of the innovators of using artificial intelligence to predict a human’s next movement when it comes to typing or tapping out a word using a keyboard found on your smart device. And no, this isn’t just another marketing ploy. The product/service needs to be outstanding, and that’s exactly what Swiftkey delivers. Gizmodo called it “the best autocorrect system” they’ve ever seen. Perhaps Swiftkey will put the aforementioned auto correct fail website out of business. Swiftkey should also help Microsoft build up its mobile portfolio. Considering the fact that Microsoft is heavily invested in its touch screen products; (i.e. the Surface lineup & Windows Mobile) the acquisition of Swiftkey comes at an opportune time. Microsoft will likely do whatever it takes for make its mobile product lineup the most productive platform on the market today. By implementing Swiftkey, an app that streamlines the art of typing out words on a mobile device, Microsoft is one step closer to becoming the dominant player in the mobile platform market segment. As for both Mr. Reynolds and Mr. Medlock: both have essentially been with Swiftkey since the start of their professional careers, which makes this sale even more impressive. Mr. Reynolds holds an M.A. in Natural Sciences from the University of Cambridge while Mr. Medlock holds a B.S.c. in Computer Science from Durham University, a Master of Philosophy in Computer Speech, Text and Internet Technology from the University of Cambridge, and a Ph.D. in Natural Language and Information Processing also from the University of Cambridge.